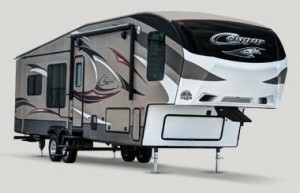 The 2015 Cougar 327RES by Keystone RV offers family fun for everyone. At 37′ long this floorplan sleeps up to 5 people, making it ideal for small and medium sized families and even couples who just want extra space. With dual living room slides and an interior that promises comfort wherever you are, you can rest confident the Cougar promises to be there as you adventure with your family. We all know that a good kitchen can mean the difference between a delicious meal with the family and carry out from your local pizza joint. This floorplan’s kitchen features a huge L-shaped counter with double sinks, a large refrigerator, 3 burner range, and two pantries that provide ample storage. 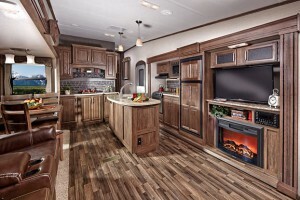 Whether you’re at the beach or in the mountains, you will love creating meals in this kitchen. After a long day making memories, you’ll want to come home and curl up in your private bedroom that features a queen sized bed located in a slide, full height wardrobes for maximum storage, a night stand, and even washer/dryer prep, which saves you from having to find a laundromat to do your laundry. Your spacious side aisle bathroom can be accessed via the hallway or the bedroom. It boasts a neo angle shower, vanity, toilet, and linen closet. Perhaps the greatest part of the 327RES is the living area, which includes a 40″ LCD TV and two huge slides that make it the size of a small apartment when parked. An inviting fireplace makes curling up with a cup of coffee or tea extra special, while plenty of overhead cabinetry allows you to store important items like extra blankets and pillows or even games to play with the family on a rainy day. One slide holds an L-shaped sofa with a hide-a-bed, while an additional includes swivel recliners.